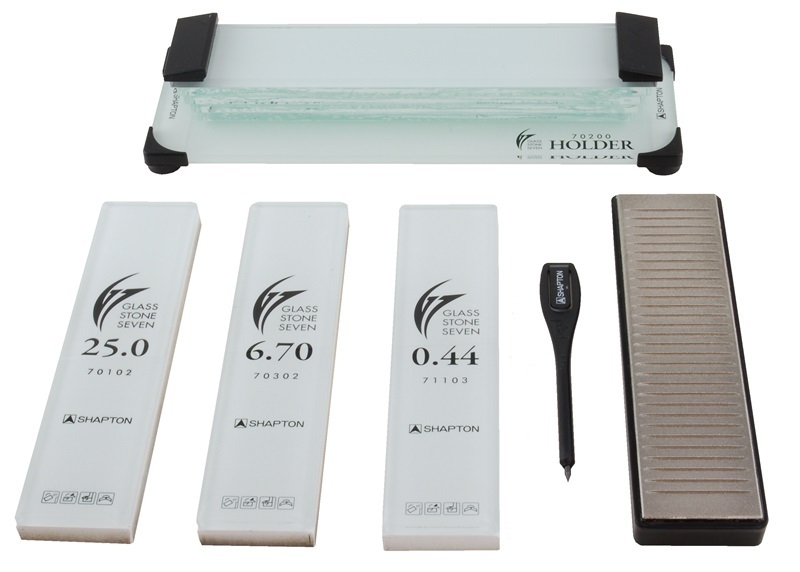 We're thrilled to introduce the new Shapton Glass Stone Seven Knife Sharpening Kit. The G7 Kit has everything you need to sharpen knives; stones, holder and diamond lapping plate beautifully presented in one box. The entire kit gives you the high Shapton quality you would expect. There really is no other knife sharpening kit like this. 25 micron - about 600 grit. This grit is used to efficiently shape an edge on dull knives. 6.70 micron - about 2500 grit. This grit is used to refine an edge shaped on the 25 micron stone, or to refresh the edge on a knife that needs only a light touch up. .44 micron - over 30,000 grit. This grit is even finer than the .49 micron/30,000 grit stone found in the HR series, and we have no other stones so fine. It is used to put the finishing touch on a razor sharp edge. The Stones of the G7 are 160mm x 37mm, or about 6-1/4" x 1-7/16". This is a bit smaller than the 210mm x 70mm, or 8 1/4" x 2 3/4", size of the HR and HC series stones. The G7 stones fit snugly into the Stone Holder. Functional and beautiful, the G7 stone holder is made of fused layers of glass with sturdy non-slip rubber feet and stops. The stones are securely held in place, and the all-glass construction is sturdy, stable and easy to clean. The 160mm x 37mm diamond plate has deep grooves for clearing waste material while flattening and is backed with sturdy rubber, making for a comfortable grip. To flatten a stone, place it in the holder and mark its surface with the included pencil. Then, using plenty of water, rub the diamond lapping plate over the stone until the pencil lines completely disappear to ensure a flat, smooth sharpening surface. Shapton has even included a pencil in the G7 Kit so that you can mark the surface of the stones prior to flattening them. This truly is an 'everything you need' package. All Shapton GlassStones are made in Japan. We have been a retailer of Shapton products for many years now, and we have always found these stones to be of consistently high quality. Sharpening Supplies is an authorized retailer of Shapton stones.